Rencana ini memerlukan kemaskini dalam Bahasa Melayu piawai Dewan Bahasa dan Pustaka. Sila membantu, bahan-bahan boleh didapati di M. Night Shyamalan (Inggeris). Manoj Nelliyattu Shyamalan (disebut /ˈʃæməlɑːn/; Bahasa Malayalam: മനോജ് നെല്ലിയാട്ട് ശ്യാമളന്‍; Bahasa Tamil: மனோஜ் நெல்லியடு ஷ்யாமலன் Maṉōj Nelliyāṯṯu Ṣiyāmaḷaṉ, lahir 6 Ogos 1970), dikenali secara profesional sebagai M. Night Shyamalan, adalah seorang pembuat filem dan penulis skrip lakon layar Amerika kelahiran India, terkenal kerana membuat filem dengan plot kuasa ghaib kontemporari yang memuncak dengan akhiran putarbalik. Beliau juga dikenali membuat filemnya (dan meletakkan plotnya) di sekitar dan dalam kawasan Philadelphia, Pennsylvania, tempat beliau dibesarkan. Shyamalan menerbitkan filem pertamanya, Praying with Anger, pada 1992 semasa masih lagi seorang mahasiswa Universiti New York. Filem keduanya, Wide Awake, dibuat pada 1995 tetapi tidak dikeluarkan sehingga tiga tahun kemudian, gagal dari segi komersil. Shyamalan gained international recognition when he wrote and directed 1999's The Sixth Sense, which was a commercial success and nominated for six Academy Awards, including: Best Picture, Best Director and Best Original Screenplay. He followed The Sixth Sense by writing and directing Unbreakable, released in 2000, which received positive reviews. His 2002 film Signs, where he also played Ray Reddy, gained both critical and financial success. His next movie The Village (2004) was a critical disappointment whose box office fell hard after a strong opening weekend, and Lady in the Water (2006) performed even worse. The film The Happening (2008) did financially better than his previous effort but was also panned by critics. His film, The Last Airbender (2010) has also received negative reviews. His latest film, Devil (2010), which he produced and wrote the story for, but did not direct, was released on September 17, 2010 and has received mixed reviews. M. Night Shyamalan and Bryce Dallas Howard at the Spanish premiere of The Village (in the San Sebastián International Film Festival, 2006). Shyamalan dilahirkan Mahé, Puducherry, India. Ayahnya, Nelliyattu C. Shyamalan, seorang Indian Malayali physician belonging to a famous "Thiyya" tharavad dari Mahe, Kerala. Ibunya, Jayalakshmi, seorang Tamil Indian and an obstetrician and gynecologist by profession. In the 1960s, after medical school (di Jawaharlal Institute of Postgraduate Medical Education & Research di Puducherry) dan kelahiran anak pertama mereka, Veena, ibu bapanya berpindah ke Amerika Syarikat. His mother returned to India to spend the last five months of her pregnancy with him at her parents’ home in Chennai (Madras). 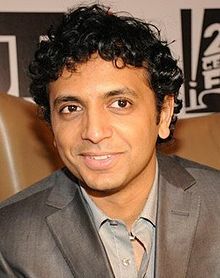 Shyamalan spent his first six weeks in Puducherry, dan dibesarkan di Penn Valley, Pennsylvania, an affluent suburb of Philadelphia. He attended the private Roman Catholic grammar school Waldron Mercy Academy, though he was a Hindu (they chose it for disciplinary reasons), followed by the Episcopal Academy, a private Episcopal high school located at the time in Merion, Pennsylvania. Shyamalan went on to New York University’s Tisch School of the Arts, in Manhattan, graduating in 1992. [petikan diperlukan] It was while studying there that he adopted Night as his second name. Shyamalan made his first film, the semi-autobiographical drama Praying with Anger, while still an NYU student, using money borrowed from family and friends. It was screened at the Toronto International Film Festival on September 12, 1992, and played commercially at one theater for one week. When the film debuted at the Toronto Film Festival, Shyamalan was introduced by David Overbey who predicted that the world would see more of Shyamalan in the years to come. Praying with Anger has also been shown on Canadian television. Filmed in Chennai, it is his only film to be shot outside of Pennsylvania. In 1993, Shyamalan married Indian psychologist Bhavna Vaswani, a fellow student whom he met at NYU and with whom he has two daughters. The family resides on a sprawling estate in Willistown, Pennsylvania, near Shyamalan's usual shooting site of Philadelphia. His production company, Blinding Edge Pictures is located in Berwyn, PA. In 2004, Shyamalan was involved in a media hoax with the then Sci-Fi Channel, which was eventually uncovered by the press. Sci-Fi claimed in its "documentary" special — The Buried Secret of M. Night Shyamalan, shot on the set of The Village — that Shyamalan was legally dead for nearly a half-hour while drowned in a frozen pond in a childhood accident, and that upon being rescued he had experiences of communicating with spirits, fueling an obsession with the supernatural. The Sci-Fi Channel also claimed that Shyamalan had grown "sour" when the "documentary" filmmakers' questions got too personal, and had therefore withdrawn from participating and threatened to sue the filmmakers. In truth, Shyamalan developed the hoax with Sci-Fi, going so far as having Sci-Fi staffers sign non disclosure agreements with a $5-million fine attached and requiring Shyamalan's office to formally approve each step. Neither the childhood accident nor the supposed rift with the filmmakers ever occurred. The hoax included a non-existent Sci-Fi publicist, "David Westover", whose name appeared on press releases regarding the special. Sci-Fi also fed false news stories to the Associated Press and Zap2It.com, among others. A New York Post news item, based on a Sci Fi press release, referred to Shyamalan's attorneys threatening to sue the filmmakers; the attorneys named were non-existent. After an AP reporter confronted Sci-Fi Channel president Bonnie Hammer at a press conference, Hammer admitted the hoax, saying it was part of a guerrilla marketing campaign to generate pre-release publicity for The Village. This prompted Sci-Fi's parent company, NBC Universal, to state that the undertaking was "not consistent with our policy at NBC. We would never intend to offend the public or the press and we value our relationship with both." Other critics have since deemed viewers to be victim of a somewhat 'cheap' promotional trick that went too far. ^ a b "The need for a Dev Patel in the Life of Pi". Rediff. 2009-02-20. ^ Edelstein, David (16 July 2006). "M. Narcissus Shyamalan". New York Magazine. Dicapai 27 April 2010. ^ NNDB -Manoj Nelliyattu Shyamalan. ^ Answers.com - Wide Awake. ^ Young Artists Award - Past Nominations Listing. ^ Associated Press (June 16, 2004): "Profile of M. Night Shyamalan goes sour: Sci-Fi Channel is still planning to air the documentary". ^ Zap2It.com (June 17, 2004): 1|,00.html "Sci-Fi Schedules Controversial Shyamalan Doc". ^ Associated Press story on CBS News site (July 20, 2004): " Sci-Fi Channel Admits Hoax, 'Documentary' On Reclusive Filmmaker Is Bogus.